Santa Ana Police Department Special Crimes Section Detectives commenced the investigation and concluded that the incidents occurred in 2015. Rojas was not a District Safety Officer when these crimes were committed. On numerous occasions, Rojas would have the victims excused from class in order to meet them for the purposes of engaging in sexual activity on campus. The victims were 17-years-old at the time and no longer students at Century High School. Rojas was arrested and confessed to the allegations. 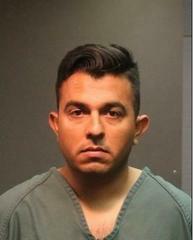 He was booked at the Orange County Jail on multiple sexual assault charges and his bail has been set at $1,000,000. SAPD Detectives believe there may be additional victims and ask anyone with information to contact Detective Nick Vega at 714-245-8368, nvega@santa-ana.org or Orange County Crime Stoppers at 1-855-TIP-OCCS.